Please -Click the link below to view and download the Rental Application for this property. Click on the Rental application Link at the top of the page for instructions and the application procedure. Rent is $2150/month. A shorter lease term can be negotiated for an additional rate. This home is also for sale by owner, please inquire for more information. This home sits on a deep preserve lot in the Wildwood neighborhood in the gated King and Bear section of World Golf Village. 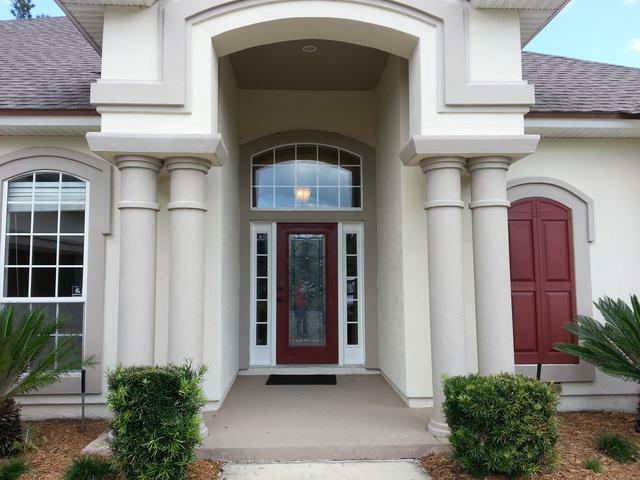 The King and Bear is a wonderful gated community in St. Augustine. The community has a unique mix of homes from luxury townhomes to multi-million dollar golf course estates. There is a swim, tennis and fitness center just a short walk or bike from the home that hosts many activities including water aerobics, zumba, foood truck Fridays, Poker games and Bunco, Holiday activities, pot lucks and MORE! The community is really like a luxury resort with miles of walking and bike trails and tons of wildlife all spread-out on many acres, very unique and tranquil and a wonderful place to call home. Pets are approved on a case-by-cases basis, no pets under 6 months old. All occupants 18 and over will be subject to a background check, credit check and income verification if required. A key factor in application approval is a credit report showing history of on-time payments with no delinquencies, judgments or charge-offs. Please review the rental application and review lease requirements and application and make sure all adult residents at the home meet the lease qualifications and credit requirements, then use form on website to make an appointment to view the home. Lease rate includes lawn fertilization. Tenant is responsible for lawn mowing and edging, but this can be arranged for an additional monthly fee. Thanks for your interest and best of luck in your search!! MORE PHOTOS and VIDEOS OF THE HOME CAN BE FOUND ON OUR FACEBOOK PAGE!